If you enjoy experimenting with watercolor, this is the collection for you! 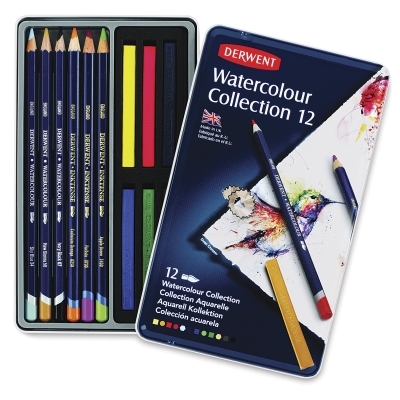 Derwent watercolor pencils can be used wet or dry to create a wide range of exciting effects, from bold, vibrant images to soft, subtle impressions. Derwent Inktense pencils have a firmer texture that allows them to perform with the brilliant intensity of traditional pen-and-ink. They can be used dry for rich, intense color or washed out with water to create a vivid translucent effect. Once dry, the color is permanent and can be worked over with other media. 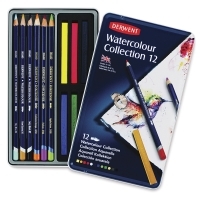 Derwent Inktense blocks are chunky, watersoluble ink blocks that can be used dry or wet. 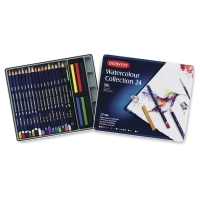 They’re ideal for loose, expressive landscapes and colorful still life paintings. They can also be used for rubber stamping, decoupage, or on fabric to create stunning silk paintings and quilts. They combine beautifully with Inktense pencils.